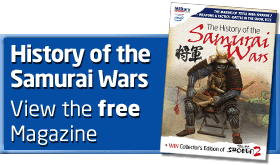 From ancient times, the value of a samurai was assessed in terms of his prowess at kyuba no michi, the way of horse and bow, whereby the elite warrior would deliver arrows from his longbow while riding a horse. Unlike the light horse-archers of the steppes, the samurai was quite heavily armoured and used his horse as a mobile ‘gun platform’. It was only when hunting that archery would be conducted at a gallop, a martial art performed nowadays at festivals under the name of yabusame. The bow itself was made of bamboo sections wound with rattan and lacquered. It was loosed from one third of the way up its shaft for convenience when riding a horse. Some bows were very powerful, and stories are told of the finest archers sending arrows through an enemy’s arm or even shattering the planking of a boat so that the samurai on board were drowned.